I saw this last year at a local store and was so excited to see this available here for sale on STP. There are several features that I really like about this coat with the pricepoint that it is at. 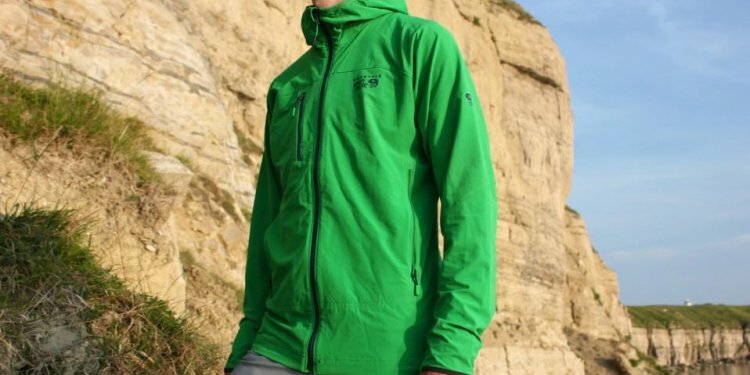 I was looking for a good, lightweight softshell for warm weather use and this fit the bill. First, it just looks good and sharp. The blue with yellow trim is very nice. Second, it fits great. This is an item you'd wear over a T-Shirt or a polypro top. I am not expecting to layer much underneath this, so the more trim fit works for me. Third, it has a decent hood that fits me well and provides some protection. Let's be honest though-this is something you are going to wear on cool days or on a hike when it gets chilly. If it rains or snows you are going to put on a hardshell. That said, it offers protection for a light shower and some wind. This is quite similar to their Zone 5 Softshell and folks may easily mistake the two because they are similar. At last check, STP has the Zone 5 here for sale. Other than the price (Zone 5 retails for $100 and SC goes for $139 MSRP), there are some notable differences between the two. Overall, the Super Chockstone is more technical and has a few more nice features that make it worth the few extra dollars. First, the fabric is 50 SPF. I doubt that the Zone 5 lacks this protection, but it is clear that the fabric was modified so that you don't have to worry about it here. Second, the fit is better with the Super Chockstone and it is more performance oriented. Biggest detail? The sleeves are articulated and fit better for active use. The Zone 5 is more of a straight-sleeve fit. Last, the Super Chockstone is SIGNIFICANTLY lighter in weight (14.6 oz vs. 19.2 oz). For weight freaks this makes a difference. In sum, the Zone 5, overall, is more for casual use or around town. This is not to say that the Zone 5 is bad, especially for the great price point, but the Super Chockstone is the next step up. There are some things I'd like to see. First, while the details are great-easy zippers, good pockets, zipper garages-I was surprised that cuffs on mine do not have thumb holes. This would be a nice feature, especially for use while hiking in cool temps. Second, while the hood is decent, I'd like it to be a bit bigger and to have a few more adjustments. Last, this is not wind or waterproof, but does well with its DWR finish and tightly woven fabric. Some folks will want a beefier or thicker fabric for more protection. If that is the case, this is not your jacket. If you're looking for a technical lightweight softshell for summer and active use that is light and at a great price point look no further. Occasionally I discover wonderful products at STP that are versatile, durable and my go to articles of clothing for certain functions. The Super Chockstone Jacket is one of those items. The fabric is durable and stretchy, yet surprisingly light weight. I now own five or six of these jackets, including the bright highly visible Ginko color for my night time walks on a busy wildlife preserve bike path. Hint : Also check out the Chockstone pants. They are sooo comfortable, you will not want to wear any other style of pants.